NEW! Limited Time Offer: Visit our “SHOP” Page for the TRIPLE POWER PACK Launch Special on all 3 of Gilat Ben-Dor’s new books! You can also find her books individually sold here, on Amazon.com. 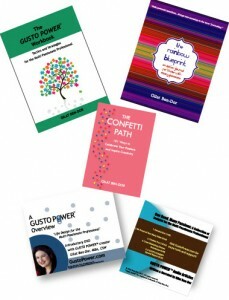 At GustoPower.com, we are excited to showcase Gilat Ben-Dor’s latest publications, from books, journals, and workbooks, to audio CDs, DVDs, special reports (see home page) and a collection of articles, available both electronically and printed (by request). These tools are just some of the ways that GUSTO POWER® can help you with your personal and professional development. Please visit our “SHOP” page on this GustoPower.com website for product and purchase details.